Nazareth: The contrasting images coming out of Israel and the occupied Palestinian territories on Monday could not have been starker – or more disturbing. 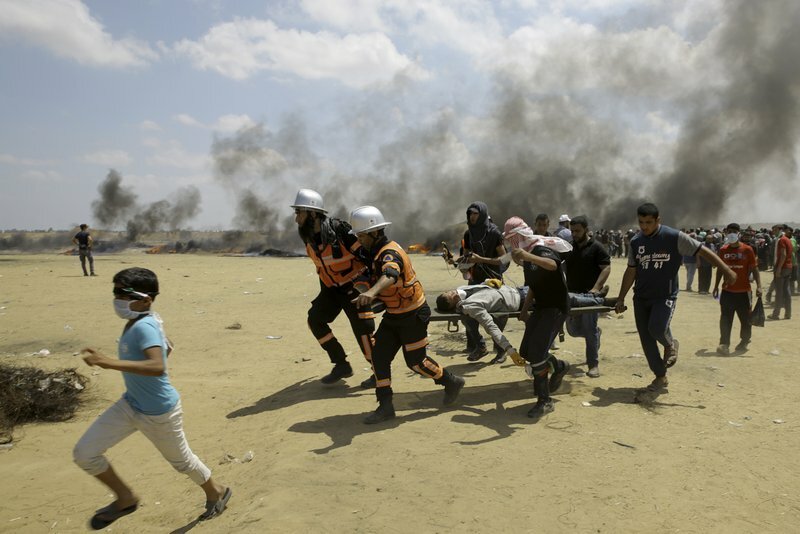 Such horror is now so routine that TV anchors could only headline the news as the worst day of bloodshed in Gaza in four years, when Israel massacred civilians in its last major military assault. Already gasping from the chokehold of Israel’s decade-long blockade of Gaza, local hospitals are now collapsing from the weight of casualties. A few kilometres away, meanwhile, Israelis were partying. So-called “liberal” Tel Aviv was busy “chicken dancing” with Netta, who had just won the Eurovision Song Contest and gave a free open-air performance to celebrate. And in Jerusalem, Israeli prime minister Benjamin Netanyahu was glad-handing a bevy of US officials, including Ivanka Trump, the president’s daughter and policy adviser. They were there to beam for the cameras as the US opened its embassy in the occupied city. The move pre-empts negotiations over the city’s fate and sabotages Palestinian ambitions for East Jerusalem to become the capital of a future Palestinian state. Netanyahu’s grin said it all. As he mouthed platitudes about “Middle Eastern peace”, he finally had Washington’s blessing for all of Jerusalem as Israel’s capital. And next year Europe will give its implicit blessing too by hosting the Eurovision Song Contest there. But amid the euphoria, a few Israeli commentators understood that politics is about more than power – it’s about imagery too. The champagne-quaffing in Tel Aviv and Jerusalem while Gaza drowned in blood left a profoundly sour taste in the mouth. There was more than a whiff of hypocrisy too in statements about “defending borders” from a state that has refused to declare its borders since its creation exactly 70 years ago – as well as from a Netanyahu government currently trying to establish a Greater Israel over the Palestinian territories. But the hypocrisy was not restricted to Israel and Washington, which parroted Mr Netanyahu’s talking points. There was an ugly equivocation from other western leaders. They spoke of “regret”, “tragedy” and “concern at the loss of life”, as though an act of God had struck Gaza, not an order from Israeli commanders to quell the Palestinian urge for freedom with live ammunition. Equally dishonest was talk of the “need for restraint from both sides” and “clashes”, as though the protesters had been tussling with Israeli soldiers in hand-to-hand combat rather than being coldly picked off through telescopic sights. Israeli politicians and media have desperately searched for a moral justification for these executions. They have talked of “kite terrorism” and a supposed stone-throwing threat to soldiers positioned hundreds of yards away. While thousands of Palestinians have been executed or maimed, how many Israelis have been harmed in the past six weeks of Gaza’s protests? Precisely none. This is a strange kind of terror. The reality is that tiny Gaza is becoming rapidly uninhabitable, as the United Nations has repeatedly warned. For more than a decade Israel has blockaded it from land, air and sea, while intermittently pummelling the enclave with missiles and military invasions. A senior New York Times correspondent tweeted on Monday that Gaza’s Palestinians looked as though they had a “death wish”. But two million Palestinians – a population rapidly growing – are inmates in what is effectively a shrinking prison, whose store rooms are almost bare. Tens of thousands of them have shown they are prepared to risk their lives not for some death cult but to win freedom, the most precious human impulse of all. And they have preferred confrontational, non-violent resistance as a way to shame Israel and the world into recognising their plight. And yet instead, Israel has stripped them of all agency by falsely claiming that they are pawns in a game by Hamas to pressure Israel. But in so far as Hamas is trying to influence Israel, what is its aim? Last week, a gloating Israeli media reported that Hamas was quietly appealing for a long-term truce with Israel, effectively renouncing the Palestinians’ right to violently resist Israel’s occupation. It would not be the first time. But whereas once Hamas sought a truce in return for a two-state solution, now it is said to have requested simply an end to the blockade and a chance to rebuild Gaza. Even this minimal concession is rejected by Israel. Instead an Israeli minister responded to Monday’s slaughter by proposing that Israel assassinate the Hamas leadership. Israel may be without remorse, but are western leaders feeling shamed? Apart from South Africa and Turkey, none has so far withdrawn an ambassador. There are no calls for embargos on sales of arms, no demands for war crimes investigations, no threats of trade sanctions. And no plans, of course, for the kind of “humanitarian intervention” western governments have keenly promoted in other parts of the Middle East where civilians are under threat. For seven decades, the west has pampered Israel at every turn. The lack of any meaningful punishment for violating Palestinian rights led directly to Monday’s massacre. And the failure to inflict a price on Israel for this massacre – in fact, the reverse: visible rewards with a relocated US embassy and the chance to host the Eurovision Song Contest – will lead to the next massacre, and the one after. Handwringing is not enough. It is time for anyone with a conscience to act.